MIDDLETOWN - Nancy J. Bennett, 56, of 518 High St., died unexpectedly Saturday, Aug. 23, 2003. 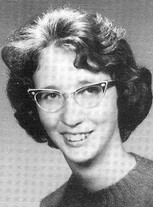 She was born in Meriden, May 11, 1947, a daughter of Elaine Gasser Bennett of Meriden, and Frank Bennett of Orange. She had been a residen of Middletown for many years. She graduated from O.H. Platt High School, Meriden, and Southern Connecticut State University, having received her degree in education. She was employed at Saples of Middletown for the past several years. She was active in the Church of Jesus Christ of Latter Day Saints of Cromwell. She was a loving daughter and sister, never failing to remember an occasion or event in the lives of her large extended family. Besides her mother and father, she is survived by three sisters and a brother-in-law, Phyllis and Thomas Hennesey of Wallingford, Carol Ivers of Meriden, and Barbara Bennet of Berkley, Callif. ; seven brothers and three sisters-in-law, David bennett of Venice Calif., Fank and Barbara Bennett of Boring , Ore., Dale and Kathy Bennett of Hampton, N.H., Brian Bennett of Durham, Floyd Bennett and Peter Bennett, both of Brigham City, Utah; Many nieces and nephews. She was predeceased by her baby brother, Bruce Bennett.